After searching through my art supplies, I finally found my miniature kitchen utensils. Below is a photo I took with the miniatures. They are so cute on top of the oven. I also love the tiles on the back panel of the oven. How I wish I could have the tiles on my kitchen : ). I am still amazed with this project Mee Foon. Hope to see and touch the little pans and can 'play' with the oven. Oh my goodness Mee Foon...you are so talented!! I just love the miniature items you have made! I make cards myself...no where near as good as yours and I would LOVE to know how you made the fan card? Could you give me some clues on how t construct it? 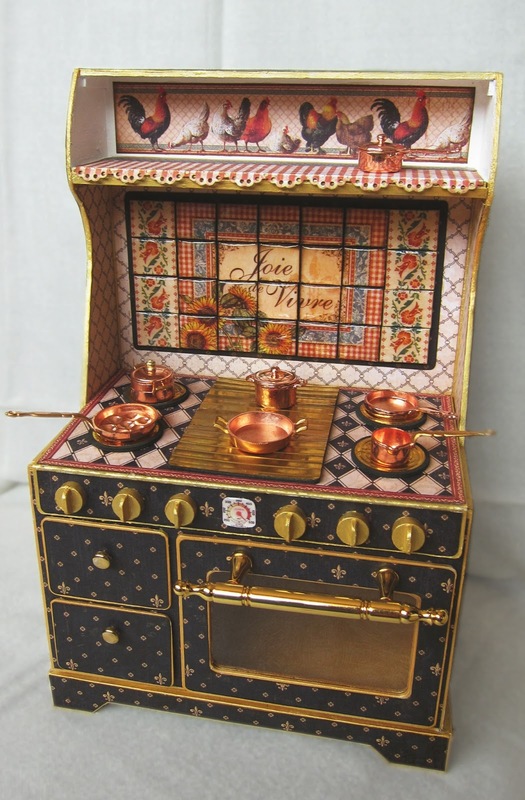 I would like to know where you purchased the minature oven and utensils- Would love to make this as well...is it possible to get info on this? Wow, this is AMAZING! This must have taken a LOT of time to create. Your attention to detail is breath-taking. All the details make this project stand out. You probably have many of them around your work room - I'm so glad you shared your talent.